Hospital for Special Surgery proposes 12-story building over FDR Drive. On August 11, 2008, the City Planning Commission unanimously approved the Hospital for Special Surgery’s special permit application to build a new 86,869 sq.ft., 12-story outpatient center on a 21-ft. high deck over the FDR Drive between East 71st Street and the mid-block line of East 72nd Street. 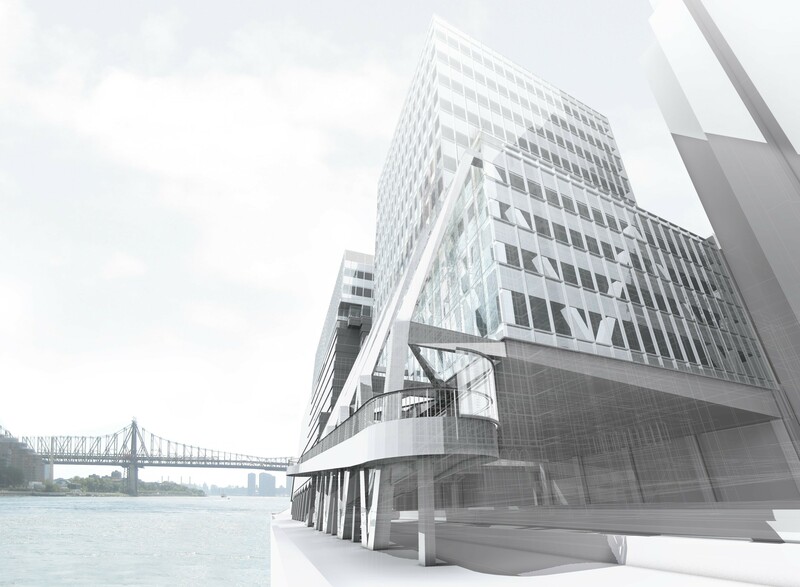 The new tower, known as the River Building, would connect to the hospital’s East Wing Building through an enclosed pedestrian bridge over East 71st Street. The Commission also approved a special permit application for an additional three stories totaling 51,000 sq.ft. to the East Wing Building, a City map amendment to eliminate portions of the FDR Drive for structural columns, and a text amendment allowing the hospital to apply for a special permit to modify loading-berth requirements. Since the River Building would be classified as a hospital facility adding more than 10,000 sq.ft. of floor area in a residential district, one additional off-street loading berth would normally be required. The hospital proposed to modify the requirement with a text amendment, allowing it, by application of special permit, to use its two existing loading berths in its West Wing Building to satisfy the loading-berth requirement. When the project reached the Commission for a hearing, several speakers in opposition testified that the number of trucks already using the existing loading-berths create considerable traffic on East 71st Street. They had reservations about supporting a plan that brought more deliveries to the area without providing more off-street loading space. Local residents of the Edgewater building, located at 530 East 72nd Street, also expressed concern that the River Building’s 190-foot height would ruin their panoramic view of the East River. The Commission acknowledged residents’ concerns of traffic congestion and blocked views, but considered both unpersuasive. It found that the hospital’s pledge to ensure appropriate use of an 85-ft. long commercial loading zone on the south side of East 71st Street, along with an increase in loading activity on East 70th Street, would alleviate traffic congestion. The Commission also noted that the East 70th Street loading facility and existing loading berths would adequately serve the River Building’s additional needs because materials could be transported across the pedestrian bridge, eliminating the threat of increased activity at grade level. As for the obstructed views, the Commission found that any further setback of the building’s north face would not improve views, and that the design, as is, represents a fair compromise between institutional expansion and environmental impact.